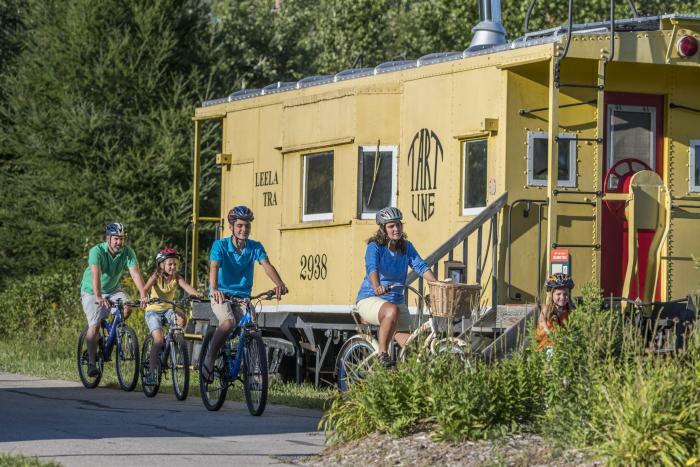 Explore Traverse City on a Bike: Tips from Norte! 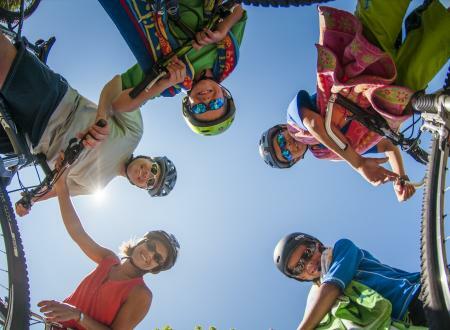 Hop on two wheels instead of four and discover Traverse City like a local from Norte!, Traverse City&apos;s bike education and advocacy group. Take the urban route and explore the off-the-beaten-path natural areas where you will see Traverse City&apos;s attractions and special events from a different perspective. A ride through town highlights the different neighborhoods, historic architecture and pocket parks that you would otherwise miss if you were driving in a car. To get you started, we mapped our favorite car-free way to get around the city. We started the route from our Norte! clubhouse, located on the south end of the Civic Center, just off Titus Avenue. The Clubhouse is the hub of Norte!, where most of our activities get started and where you can utilize a full bicycle library and workshop. Library bikes are available for check out to all awesome kids, locals and visitors. Bikes are also available from one of the bike shops around town. From there, head south on Hastings Street to hook up with the TART Trail. Traverse Area Recreational Trails maintains a network of bike paths around Traverse City, linking all the neighborhoods together. This gives us a straight shot to one of our favorite places in the world, the Traverse Area District Library. This is not just any ordinary library! Filled with plenty of resources and activities for a short or long term visit, the library is a great place for a pit stop. Magazines and books are the best way to wile away a few hours on a cozy couch (especially on a cloudy or very hot day). When it’s sunny and the temperatures are mild, Hull Park sits right behind the library and offers sparkling views of the Boardman Lake. There&apos;s also a Children&apos;s Garden adjacent to the building. Complete with a garden path, sundial and wooden train structure, this whimsical spot is perfect for little ones needing a break from pedaling. After resting, it&apos;s now time for exploring. Back on the bikes and off to the West side by taking Tenth Street across Cass Street and turning north on Locust Street to get on Seventh Street. Seventh Street is a one-way road that makes it easy to cross Division Street. From there, head south on Elmwood Street and take it to Eleventh Street, where you will find the former state hospital grounds that are now home to The Village at Grand Traverse Commons -- a collection of historically renovated buildings sitting among an extensive network of fun and challenging trails, including a 250 foot climb to the top of the hill that overlooks Downtown Traverse City. These trails can be tough, but if you’ve got some time and don’t mind getting a little dirty, they’re worth checking out. Going back to town means turning north and east on Sixth and State Streets. Sixth Street is a classic brick road that runs just parallel to the slightly busier Front Street. It&apos;s a quiet and relaxing ride covered through a historic tree-lined neighborhood. Once you’re back downtown, it’s time for a snack (perhaps you picked something up at the Commons; try Higher Grounds for coffee and treats) and a stop at Hannah Park. Located just off Sixth Street, Hannah Park is the perfect spot to relax, read, listen to music, or just watch the Boardman River flow past. Packed up and on the road, you’re going to be ready for a dip in the bay. Instead of the West End beach, we really like taking State Street east and cutting through the Civic Center to get to a quieter beach, East Bay Park. Plenty of room, a great playground and a quiet neighborhood, this is an ideal location to take a dip and cool off before a short ride back to the Clubhouse. Just head to Eighth Street, where you can use the light to safely cross US-31 and use the big bike lane to get back to Fair Street and roll into the Civic Center. If you&apos;ve still got a bit of energy to use up, there&apos;s a brand-new playground just across the parking lot from the Norte Clubhouse that the kids absolutely love! Norte! is strengthening community and building a stronger, better connected and more bicycle friendly Traverse City by developing education and bike advocacy programs. Visit their website for details and event information.